Medina was talking about Global Technology Preparatory, a public middle school that had introduced him to Google’s Code Next program, which is designed to recruit gifted black and Latino students into the tech industry. “Because of Global Tech, I know as much computer science as a college freshman or sophomore,” he added. Medina was among dozens of alumni, parents, former teachers, and community members who came out, over the last two weeks, to offer testimonials for the small school that, they say, did big things for the poor kids of color in its charge. However, last week, at a contentious hearing of the Panel for Education Policy, which makes the final determination on proposed school closings and mergers across the city, the education department won approval for its plan to “merge” Global Tech with P.S. 7, a K-8 school. The two schools share a building on East 120th Street in East Harlem. Global Tech, which was founded under Mayor Bloomberg, is one of the rare schools effectively being closed even though it is not failing; the reason given by the education department is that the two merged schools are both under-enrolled. A one-to-one laptop school, Global Tech has consistently scored above its peers on standardized tests. It also has offered supports that have enabled a population of poor students of color, over one-third of whom had Individualized Education Plans (I.E.P.s), to attend some of the city’s best public schools. Most of its alums also have gone on to college. By the start of this school year, middle-school classes at the two schools were already co-mingled. The MacBooks once assigned to each Global Tech student are scattered throughout the building. Students with I.E.P.s are not receiving mandated services, according to several parents and former teachers who maintain contact with Global Tech families. While Global Tech’s after-school program is still offered by Citizen Schools, a nonprofit contracted by the city, it is no longer mandatory and few students attend. There have also been reports of “raging fights” and “chaos and disarray,” according to a broadly distributed email from Chrystina Russell, the school’s founding principal. Estrella also replaced P.S. 7’s principal, Jackie Pryce-Harvey, who had helped found Global Tech. After Pryce-Harvey’s departure, some special programs there also disappeared. Indeed, at one point, Baiz and Pryce-Harvey had suggested merging P.S. 7’s middle school with Global Tech, under Baiz’s leadership; but the idea was rejected by Estrella. “Respectfully, GTP never had a problem with resources,” said Ramona Gross at the joint public hearing on Global Tech. Gross credits the school and its programming for the fact that her son, William, who had an I.E.P., is now a freshman at Utica College. “He came to Global Tech a small, quiet, scared, stuttering kid,” said Gross. “Global Tech taught him leadership” and self-confidence. Current parents and students also say they are unhappy with the merger. Ysabel Martinez’s youngest son, Joseph, picked Global Tech because his brother Josniel had a wonderful experience at the school. Josniel, who had an I.E.P., represented Global Tech at a White House conference in 2011; he now attends York College, a four-year CUNY school, and aspires one day to become president. The boys’ mother says, in Spanish: “I didn’t know about the changes. I didn’t know the principal had left, that it’s a different school.” Joseph is not happy at the merged school, she adds, and they are now looking for a new school. During her turn at the microphone, Shannon Meminger, a former Global Tech dean, reeled off well over a dozen partnership-based programs the school had offered, many of them anchored by a mandatory after-school program, itself a partnership with Boston-based Citizen Schools: the Apollo theater, Google, Little Kids Rock, as well as other arts- and science-oriented programs. Yet, the one thing Global Tech has struggled with since its inception is enrollment. The school has never had more than about 175 students and enrollment has plunged during the recent year of turmoil to fewer than 130 students. Neighborhood charter schools, which now educate one out of every four children in Harlem and cream students who do well on standardized tests—one reason public schools like Global Tech fill up with kids with I.E.P.s.—may contribute to the enrollment challenges. Private donations also allow charters to spend on advertising and recruiting families. Others at the hearings blamed Bloomberg who built his new small-school strategy on closing failing schools. The problem with this theory is that Global Tech’s entrepreneurial approach to raising funds and forging partnerships, its dedicated educators—not a single teacher left during Baiz’s last year as principal—and relatively strong student performance, made it just the sort of small school the Bloomberg administration was inclined to protect. Not so Carmen Fariña, the schools chancellor who will soon retire, and who has expressed her distrust of small schools and overseen 21 consolidations. “We don’t run schools as charities,” Fariña said during last week’s panel hearing. 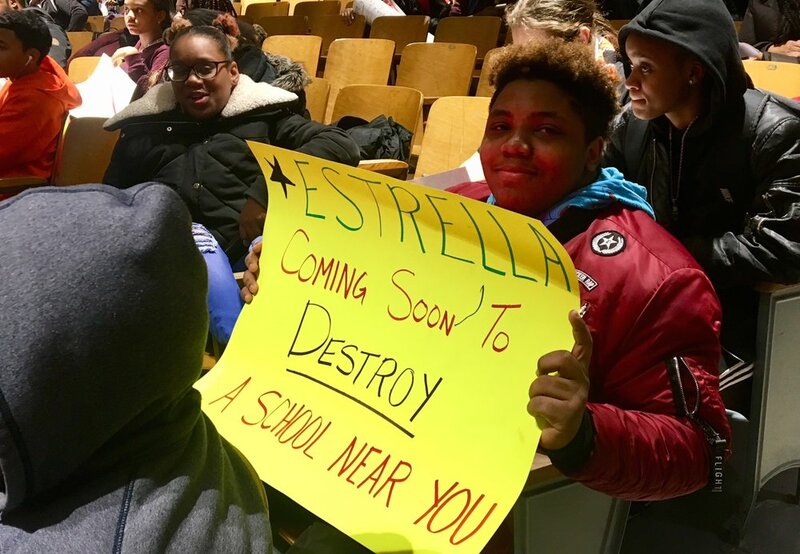 Nor did she respond to demands for an investigation of superintendent Estrella, whose actions at Global Tech, as well as other District 4 schools, including Central Park East 1 and Esperanza, have earned her censure and scorn. There are two lessons from the unraveling of Global Tech: First, the process for getting meaningful community input before schools are closed or merged is broken. Second, the education bureaucracy that Mayor Bloomberg tried to dismantle is, under Mayor de Blasio, as strong as ever.